on your own. If you want to share them with others, just follow the links in the balloons of the 360cities.net layer that will take you to the website to join the 360cities.net community. 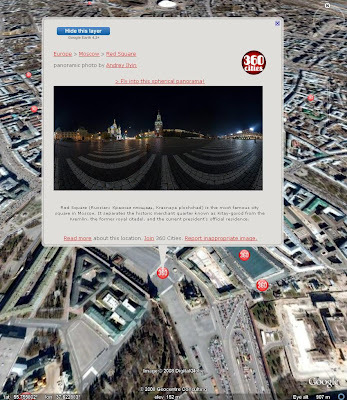 This week, we've started to feature another layer in the Google Earth Gallery, showing several thousand panoramic views provided by 360cities.net. This layer contains exciting 360 degree panoramas from a variety of great photographs taken all over the world! Do you want to explore some beautiful spots in Central Park, or be impressed by the beautifully illuminated Kremlin at night as seen from the Red Square in Moscow? 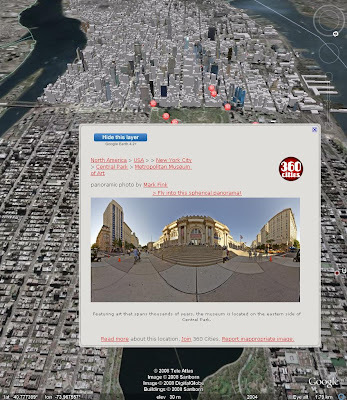 These amazing panoramas from 360cities.net will provide you another way to browse user contributed pictures and information in addition to our Panoramio and Wikipedia layers. Are you also an enthusiast taking panoramic views? It's not difficult to add your images as Photooverlays to Google Earth on your own. If you want to share them with others, just follow the links in the balloons of the 360cities.net layer that will take you to the website to join the 360cities.net community.